Sarah Tulley, manager of the As You Like It Cafe at the Westport Library. They say reading is food for the mind, but man cannot live on Stieg Larsson alone. Fortunately, if you're going to spend the day doing research or writing your thesis at the Westport Library, the As You Like It Café is ready to satisfy your hunger for both food and knowledge. Nine years ago, the café opened under the management of an outside vendor. Shortly after, however, operations were taken over by the library, and proceeds now benefit library programs and operations. "Last year, we did a series of focus groups about the library in general," said Sarah Tunney, the café manager. "People said that they wanted healthier options in the café, and we've really tried to respond to that." So out went the candy and corn syrup-filled sodas. Now the soft drinks are locally bottled and sweetened with cane sugar, and organic milk and juice boxes are also available. Whole grain muffins and scones are baked locally, and sandwiches, available seven days a week, are prepared by Oscar's Deli and the Organic Market. "We're really focusing on local products," said Tunney. "We're interested in locating bakers who may not have a shop and give them a place to sell their goods. There's a lot of talent out there, a lot of good cooks." Right now, some of the menu items include carrot cake from Connie's Cakes and scones from Doc's, and soon there will be mini-quiches from Peace Tree Desserts. Tunney is also working on getting gluten-free items in stock. 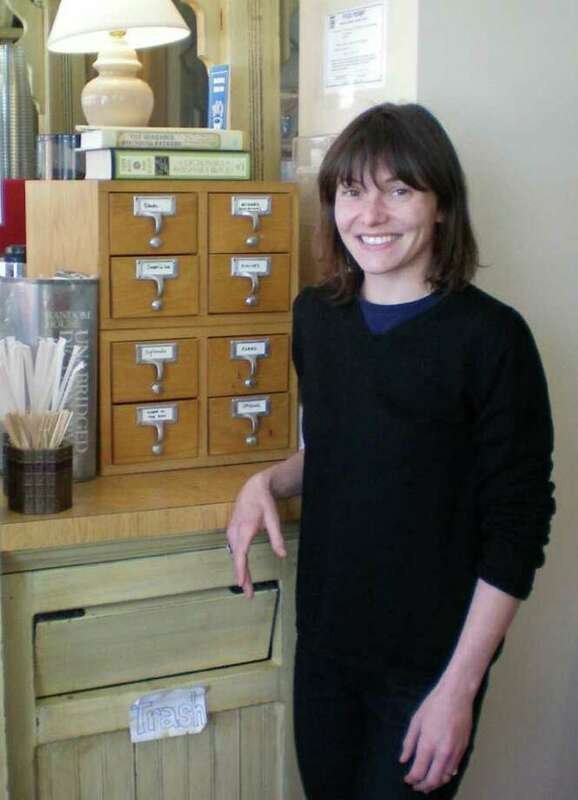 Some of the café's best sellers include an avocado-and-cheese sandwich and Jaina Chai, a chai tea latte named in honor of Teen Services Librarian Jaina Lewis. "Jaina Chai is a great example of the local focus we're prioritizing," Tunney said. "It's made with black tea from Arogya Tea of Westport, spices from Penzey's in Norwalk, and Andrew's Honey from Silvermine Apiary in Norwalk." Along with a featured coffee and muffin each day, there's also a "word of the day" written on the blackboard. Various dictionaries and etymology books line the counter. The mirrored back wall has been transformed into a "Pay It Forward" center, where you can leave a note for a friend (or stranger) saying you've bought them a cup of coffee or a pastry. "Parents do it for their kids, co-workers do it for each other," said Tunney. She said her son and his friend have been buying treats back and forth for each other. "The customers run the gamut in every single way," said Tunney. "We have folks who come in and spend the whole day here, people who rendezvous for a meeting, and we have many wonderful regulars." One such regular is Mark Lindsey, of Easton. He visits the library café almost every day after he goes to the gym. "It's nice to be able to sit quietly," he said. "It's a lot quieter than Starbucks." "And," he said, pointing out the window at the Saugatuck River, "the view is beautiful." The As You Like It Café at the Westport Public Library is open Monday through Friday from 9 a.m. to 5 p.m., Saturday from 9 a.m. to 3 p.m. and Sunday from 1 to 4:30 p.m. For more information, call 203-291-4829.